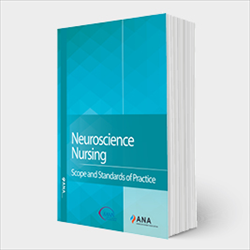 The American Association of Neuroscience Nurses (AANN) and the American Nurses Association (ANA) have collaborated to produce Neuroscience Nursing: Scope and Standards of Practice, 3rd Edition. This publication guides RNs through the essentials of neuroscience nursing and provides a framework for practice at all levels and settings. It reflects the most current thinking in the specialty and offers a blueprint for neuroscience nursing philosophy, principles, and practices. Neuroscience Nursing: Scope and Standards of Practice is a comprehensive, up-to-date delineation of the competent level of nursing practice and professional performance common to and expected from neuroscience registered nurses whatever their practice levels or setting. It reflects the most current thinking in the specialty and offers a blueprint for neuroscience nursing philosophy, principles, and practices. The publication’s scope of practice addresses what is expected of all neuroscience registered nurses, specifying the who, what, where, when, why, and how of neuroscience nursing practice. The detailed discussion of that scope of practice provides the context needed to understand and use the standards. The 17 standards are those by which all RNs in neuroscience nursing are held accountable for their practice. Each standard is measurable by a set of specific competencies that serve as evidence of minimal compliance with that standard. This foundational volume reflects the diverse activities of neuroscience nursing and serves neuroscience nurses in their personal lives, clinical practice, education, research, and community service. Although primarily for neuroscience nursing practitioners, educators, students, and others directly involved in nursing care, research, advocacy, and certification, this book can also inform other healthcare providers, researchers and scholars as well as employers, insurers, lawyers, regulators, policy makers, and stakeholders.